Like past efforts to curtail continued use of grandfathered unlimited plans, specifically those tied to smartphones like iPhone, the latest attempt by AT&T puts an artificial cap on high-speed data transmissions to free up its congested 4G LTE network. Set at 22GB per billing cycle, the new threshold could mark a slowdown in data speeds in certain vaguely defined circumstances. 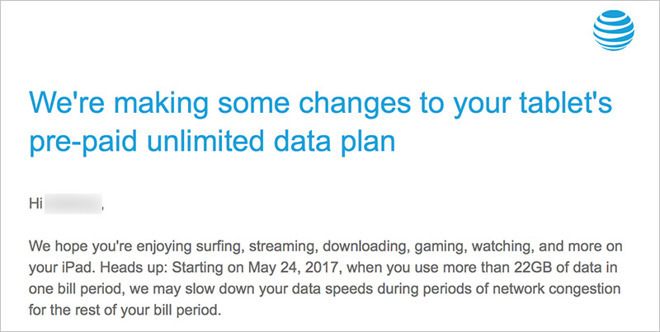 In an email to grandfathered tablet data customers, AT&T says, "We hope you're enjoying surfing, streaming, downloading, gaming, watching, and more on your iPad. Heads up: Starting on May 24, 2017, when you use more than 22GB of data in one bill period, we may slow down your data speeds during periods of network congestion for the rest of your bill period." The change brings AT&T's tablet data services in line with the carrier's unlimited smartphone plans, which launched in February with identical throttle limits. For iPad owners, the new restrictions come as somewhat of a surprise considering AT&T largely left its grandfathered unlimited tablet plans intact for the past seven years. When Apple's slate first launched in 2010, telcos marketed no-contract unlimited plans to entice owners to their respective networks. Months later, AT&T capped 3G data tiers at 2GB per month, but allowed existing subscribers to carry over their unlimited plans as long as they continued to pay monthly fees. AT&T previously stirred up controversy when it throttled grandfathered unlimited smartphone plans in 2011. The decision to throttle unlimited users caught the ire of the Federal Trade Commission, which filed suit against AT&T in 2014 for deceptive practices. That suit was dismissed last year. Grandfathered unlimited tablet users pay $29.99 plus tax for continued service. By comparison, AT&T's current prepaid DataConnect Pass Auto Renew option in the $30 range buys 4GB of data, with the added benefit of tethering.